Clarkson on Twitter: "Apparently they want us to make a car show." LONDON (Bloomberg) -- Jeremy Clarkson, the TV presenter who was ousted as host of “Top Gear” this year, will front a new show on Amazon.com Inc. in 2016, underscoring the online retailer’s drive to push its streaming service with big-ticket names. He’ll be joined by his “Top Gear” co-presenters Richard Hammond and James May, Amazon said on its website. The show will be available exclusively to Amazon Prime members. Amazon “now saying I can’t be their chief drone pilot. 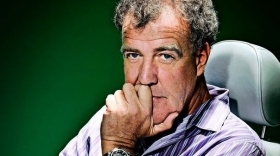 Apparently they want us to make a car show,” Clarkson said on his Twitter page today. The team, which also includes former Top Gear producer Andy Wilman, have committed to three seasons of the show. Amazon didn’t release a name or any additional details about the program. Clarkson left the British Broadcasting Corp. in March after he attacked a producer in what the network called a “physical altercation accompanied by sustained and prolonged verbal abuse of an extreme nature.” It proved to be the last straw after the 55-year-old presenter courted controversy in recent years. Less than a year earlier, Clarkson had apologized after appearing to use a racial slur in one of the takes of his show. Still, the “Top Gear” franchise was one of the BBC’s most popular with Clarkson, Hammond and May’s car races across Africa and to the North Pole attracting global audiences of 350 million viewers. The BBC said in June that radio host Chris Evans will be the new face of “Top Gear” and has signed a three-year deal to head the show’s new lineup.